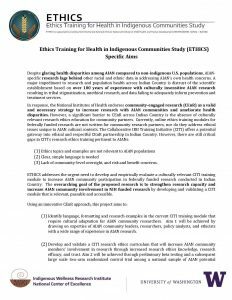 ETHICS aims to strengthen research capacity and increase community involvement in NIH-funded research by developing and validating a culturally-adapted ethical research training that is relevant and accessible to American Indian and Alaska Native (AIAN) communities. Using a community-engaged approach, this innovative study will address ethical challenges in conducting AIAN-based research by increasing community involvement in research oversight, design, implementation, and dissemination. 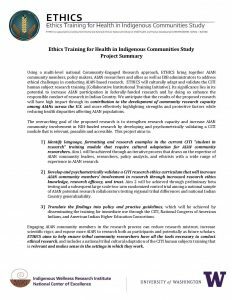 ETHICS has the potential to increase AIAN participation in federally-funded research through a culturally-adapted online research ethics training and by doing so enhance the responsible conduct of research in Indian Country. To learn more, please see the Specific Aims and the Project Summary in the documents below.